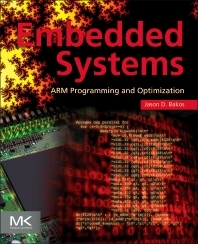 Embedded Systems: ARM Programming and Optimization combines an exploration of the ARM architecture with an examination of the facilities offered by the Linux operating system to explain how various features of program design can influence processor performance. It demonstrates methods by which a programmer can optimize program code in a way that does not impact its behavior but improves its performance. Several applications, including image transformations, fractal generation, image convolution, and computer vision tasks, are used to describe and demonstrate these methods. From this, the reader will gain insight into computer architecture and application design, as well as gain practical knowledge in the area of embedded software design for modern embedded systems. Jason D. Bakos is an associate professor of Computer Science and Engineering at the University of South Carolina. He received a BS in Computer Science from Youngstown State University in 1999 and a PhD in Computer Science from the University of Pittsburgh in 2005. Dr. Bakos’s research focuses on mapping data- and compute-intensive codes to high-performance, heterogeneous, reconfigurable, and embedded computer systems. His group works closely with FPGA-based computer manufacturers Convey Computer Corporation, GiDEL, and Annapolis Micro Systems, as well as GPU and DSP manufacturers NVIDIA, Texas Instruments, and Advantech. Dr. Bakos holds two patents, has published over 30 refereed publications in computer architecture and high performance computing, was a winner of the ACM/DAC student design contest in 2002 and 2004, and received the US National Science Foundation (NSF) CAREER award in 2009. He is currently serving as associate editor for ACM Transactions on Reconfigurable Technology and Systems. Read & practiced a lot of this book on the RPI. This is a great book of you write soft/firm-ware on ARM processors, using Neon and other low level ops. I have it on my desk at work. I have been using it for work and hobby (maker).